If passengers are unable to fly on time due to severe weather conditions, thick fog or an ash cloud, generally speaking, they are not entitled to compensation. This is because weather conditions are considered as an “extraordinary circumstance”, as referred to in Article 5 III of Regulation (EC) No. 261/2004. The airline has no control over such circumstances, nor can they stop them from arising, even if “all reasonable measures had been taken by the air carrier concerned to avoid the delays or cancellations” - according to the EU Regulation. When am I entitled to compensation in the event of storms? Your flight was no more than 6 years ago. What should I do if my flight is disrupted due to weather? Is it possible to claim compensation for bad weather? As established by EU Regulation 261/2004 , passengers can receive between €250 and €600 in cases of flight delays, cancellations or overbookings. The exception to the rule are flight disruptions caused by ‘extraordinary circumstances’. In this case airlines are under no obligation to pay out compensation to customers. Extreme weather conditions such as ash cloud fall under this category and thus passengers are not eligible for a compensation. However, there are exceptions to this rule, under which the airline may be held liable for damages caused by cancellations or delays. In order for the European Regulation to apply, the flight must have taken off from a European airport, or must have been operated by a European airline and landed in the European Union. These conditions apply regardless of the ticket price, and also apply to those travelling on business or on package holidays. Your claims are valid up to 6 years retrospectively. In which cases will you not receive compensation due to bad weather? Ash cloud: When a natural disaster occurs, it’s force majeure. Air traffic is affected and flights cannot operate. The ash cloud hinders the visibility of the pilot and ash particles can affect the sensors of the height and speed measuring instruments. Adverse weather conditions: Aircraft must often remain on the ground or take off later when extreme weather occurs. Adverse weather conditions such as snow, storm, freezing rain or fog exempt airlines from paying compensation. Stormy front: The Darmstadt Regional Court ruled that there is no compensation either, if the previous flight is forced to land in an emergency because of a stormy front and the next flight is delayed or cancelled as a result. When an aircraft’s take-off is delayed or cancelled due to bad weather, this is presumably because the conditions are such that it is deemed as unsafe to fly. If this is the case then of course it makes sense for the airlines to postpone flights until a suitable time arises. But, the airlines have been known to use bad weather as an excuse for what was actually an avoidable delay or cancellation. However, a key indicator to determine the veracity of the airline’s claim will be if the other airlines are operating flights as normal while yours is disrupted. Airlines sometimes cite "bad weather" as the cause for flight disruption, in order to alleviate themselves from issuing compensation. This becomes evident when your flight is cancelled, but the other airlines' flights are not affected by the so-called "bad weather". However, it is difficult for passengers to prove that the aircraft was actually capable of taking off. Flightright has databases to check both the weather and flight information, so we can easily determine which aircraft were able to take off or not. This is a valuable asset to support your claim. Another pretext commonly invoked by airlines is the absence of de-icing fluid in an aircraft. In recent years, many airlines have considered a flight cancellation due to negative temperatures and the impossibility of de-icing their aircraft as an "extraordinary circumstance". Airlines can be held liable for the non-defrosting of their aircraft if the delay due to bad weather is related to a lack of de-icing fluid. In this case, it is not an "extraordinary circumstance", since the company should have anticipated the problem, and you can therefore claim compensation. Are you currently affected by a flight delay or cancellation and you are not sure whether bad weather is the real cause? Find your delayed or cancelled flight in our table and check whether you are entitled to compensation. How can I claim compensation for bad weather? Flightright accompanies you by taking the necessary steps to claim the compensation that may correspond to you. 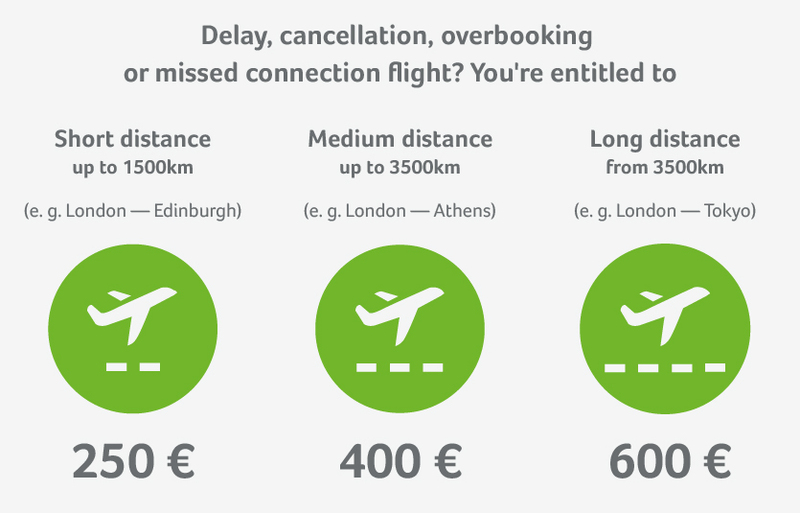 It's as simple as that: enter your flight information in our benefit calculator. Within 2 minutes, we will tell you whether or not you can claim compensation. Thanks to our databases, our technological resources and our team of European experts, we are able to determine whether cancellation or delay is considered an "extraordinary circumstance", or whether you are eligible for compensation. Does the compensation benefit calculator confirm that you are eligible for compensation? Just one click is enough to give us your authorization and save you the time-consuming and time-consuming procedures with the airline. With Flightright, you can count on a committed ally who specializes in air passenger rights. Our international network of experts has already managed to recover more than 100 million euros in compensation for our clients. Which benefits should I get at the airport? Checklist: When are you not entitled to compensation in case of bad weather? When an airline goes on strike, it is often the case that everything comes to a standstill. Hundreds of flights are cancelled and passengers are left behind at a loss - with a whole number of questions on their lips: Am I entitled to an alternative flight? Can I take the train instead? Can I get my money back? Can I claim compensation? We show you what your rights are in the event of strike.